Blood samples have always been regarded as efficient indicators of health, but with new applications of biometric skin patches, it turns out sweat is as well. 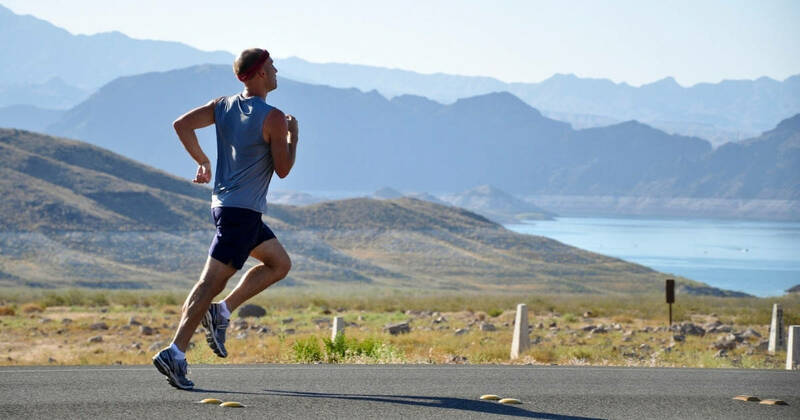 Researchers at Northwestern University have discovered that sweat contains a significant amount of health information, from electrolyte content to biometric stats. Sweat, or perspiration, is made up of water, salt, ammonia, urea, and sugar. Each person is born with roughly 2 to 4 million sweat glands, all of which become active after puberty. Sweat is easy to produce and collect, and is something that every human can create. Because of this, sweat can serve as a simple and plentiful medical sample source that doctors can collect quickly and non-invasively. To utilize this non-invasive form of biometric exploration, the researchers at Northwestern University came up with the idea of a sweat-absorbing patch. This patch is able to take samples of sweat from the user and relay information back in a matter of seconds. Completely battery and electronics-free, this patch has the potential to change the way biometrics are tested, worldwide. 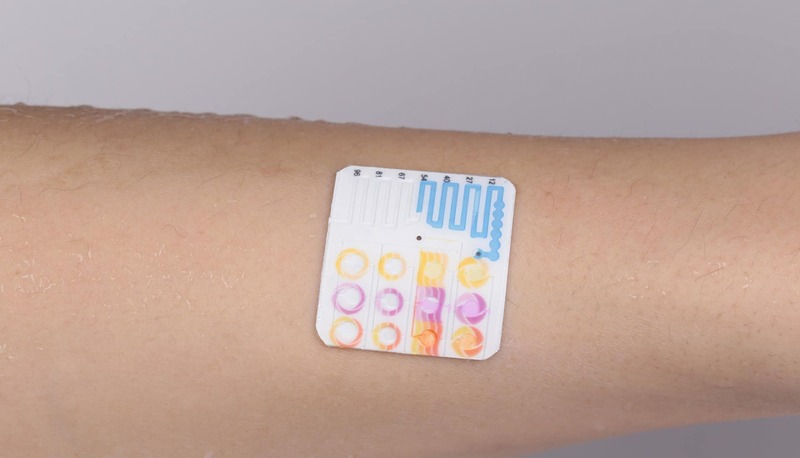 Similar to a bandaid, these biometric skin patches are thin pieces of silicone that adhere to the skin. Once applied, the users are encouraged to begin an exercise or activity that results in a fair amount of perspiration; Enough to get a sample from. Depending on where the patch is placed, this could take only a matter of minutes. Each patch has an inlet of openings at its base for the sweat to enter. Once a trickle of sweat is formed near the patch, it will be guided into the inlet for collection. There are then a collection of small channels and reservoirs that are able to hold the sample while the results are being determined. In order to test the sweat, various food colors and chemical reactants are placed within the device ahead of time. The sweat then reacts with these solutions to create visual cues on the device's surface, to alert the user of their electrolyte and hydration levels. Depending on the chemical reactants used in the patch, a number of different biomarkers can be tested for. Glucose, lactate, electrolyte concentration, and PH balance are all factors that can easily be tested with the patch in as little as a few seconds. With more experimentation, we can expect the team to introduce additional chemical reactant options soon, based on user need and preference. The researchers also worked side-by-side with a group of developers to make an app to work in-depth with the patch users. Basically, the colors that show up on the patch are meant to be general indicators. But, with the app, users can take photos of the patch's color results and upload them for deeper analysis. The app has a specially-designed algorithm that can analyze the colors on the patch for detailed, more precise results. A significant amount of support and attention have been given to the sweat patch, mostly from athletes and companies like Gatorade. Sports teams and academic scholars have also looked into the technology behind the sweat patch. It's safe to say that these researchers have found a niche in both the sports and the medical fields. The obvious use for the sweat patches is for athletes and sports teams. Monitoring hydration, electrolytes, and lactate levels can make a huge difference in athletic performance. But with more research, the sweat patch has the potential to be a far less invasive alternative to finger pricks and blood tests. 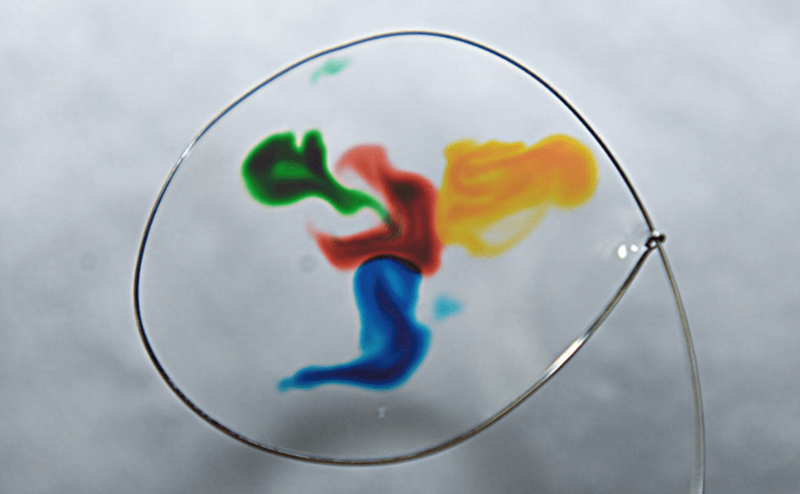 Sweat could serve as a way to monitor blood sugar, chloride levels in patients with kidney problems, and even asymmetries on the right and left sides of the bodies of people who suffered from a stroke. It's also worth considering that sweat patches could be used on patients to monitor and record their results both inside and outside of the hospital. In hospitals, nurses could use it as a non-invasive measurement tool on patients who may become queasy from needles and blood, children included. Or, it could be used to track information on patients who are sent home in between hospital visits, such as those on kidney dialysis. As of right now, the research team is also pairing up with the US Air Force to offer these skin patches to those in the Military. For soldiers on missions in hot, desert climates, the patches could serve as a great way to monitor hydration levels. Soldiers are often not used to the climates of the areas they are deployed to, making them more inclined to reach levels of dehydration. The technological advancements we're seeing in the medical field are truly remarkable. From algae skin grafts to a 10 minute cancer screening, the innovation of medicine is saving thousands of lives everyday. Who knows, maybe you'll be wearing a sweat patch of your own in just a couple of years. The future of medicine is bright, and living healthy, longer lives is becoming a real possibility.